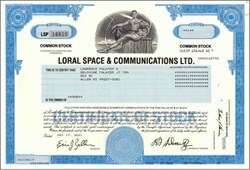 Beautifully engraved certificate from the Loral Space & Communications Ltd. . This historic document was printed by the American Banknote Company and has an ornate border around it with a vignette of an allegorical man. This item has the printed signatures of the Company’s Chairman of the Board (Bernard L. Schwartz) and its Secretary. Loral Space & Communications (NYSE: LOR), a leader in satellite communications, has substantial activities in both the manufacture and operation of geosynchronous and low-earth-orbit satellite systems, as well as in the development of satellite-based networks for the provision of an array of communications and information services. 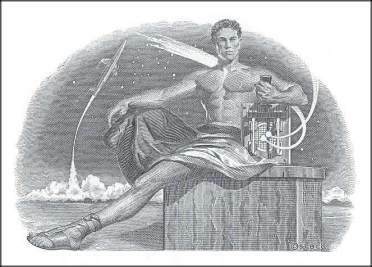 Loral Space & Communications is a high technology company that concentrates primarily on satellite-based services and satellite manufacturing, including broadcast transponder leasing and value added services, domestic and international corporate data networks, broadband data transmission and Internet services.